The Short 14" Seat Cover will fit the Brewer DSS135, Salli Chin, Salli Sway, and late model Salli Multiadjuster, Salli Strong, Salli Swing, Salli SwingFit, and Salli Twin. The Long 15" Seat Cover will fit early model Salli Multiadjuster, Salli Twin, Salli Strong, Salli Swing, and Salli SwingFit. A Long 15" cover can be used on a shorter seat, but it will not fit as smoothly and tightly as a cover sewn for a shorter seat. Measure the maximum distance from the rear inside corner to the front curve. 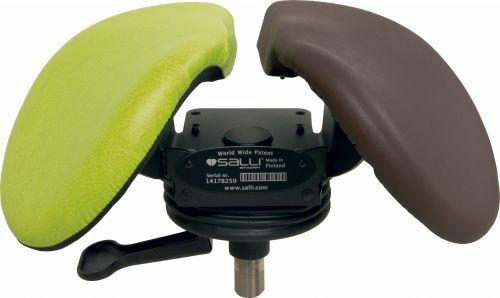 The contour and thickness of the molded foam in the Salli Saddle Chair has changed over the years. The more recent the model, the thicker the padding. When measuring your foam, please be sure to measure only the firm foam. 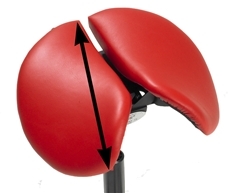 Do not include the soft fluffy fiber padding on top of of the foam in your measurement. If you have any questions, please contact us. If the foam in your seat is about 2" thick in the rear, you have the most recent model (2015 or later). If the foam in your seat is 1-1/2" thick or less, you have an earlier model (2015 or earlier).